Every Friday I get to visit one of my favorite people on this huge spinning ball we call earth. My Milk Farmer. Well, to reduce him to that it almost a crime. He is a good honest man, dedicated to the local real food movement. I am honored to have created this loaf for him and his wife. 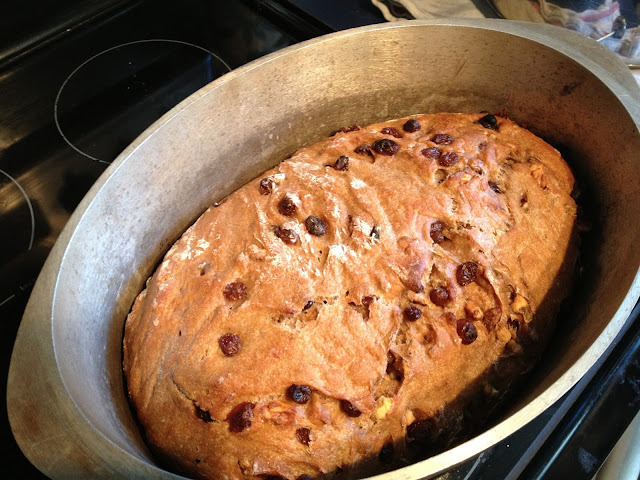 It is Raisin Walnut Bread, their favorite and weekly breakfast staple. Made with freshly ground flour, and soaked overnight to maximize nutrient absorption. I bake it like my Soaked Bread, in my grandmother's dutch oven. And do my best to deliver it warm to him each Friday. My most pleasurable moments are when he finds it still warm, and must cut off the end. We sit and chat about food politics and how we can fathom a return to Eden in the food scene. My children play with his barn cat and chase his chickens. At this moment in the week I feel connected. To mankind. To the earth. To the beautiful Jerseys that chew on the grass I walk on and make me white gold. It will drip from my children's mouths and sit on their upper lip. It will be in my coffee first thing in the morning, or wash down my chocolate chip bedtime snack. I dream of ways we can all begin to interconnect our needs with each other. Not in socialism, or capitalism, but in respect for one another's work, and care for our fellow human beings. I know, it's just milk, and it's just bread. And you can pick it up at the gas station on your way home to the suburbs in your big SUV. But does it have to be that way? This bread takes time, this milk, the utmost care and then, it is so, so much more! Mix all of the dry ingredients together (not the raisins and walnuts). 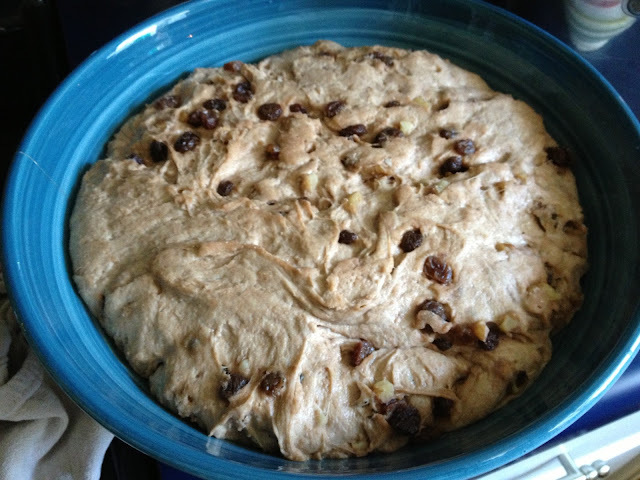 On low add kefir and once incorporated begin adding water slowly until a slightly sticky or shaggy dough forms. Add in raisins and walnuts until evenly incorporated. Cover and allow to sit 7+ hours or overnight. Preheat oven with a covered dutch oven in it to 500. 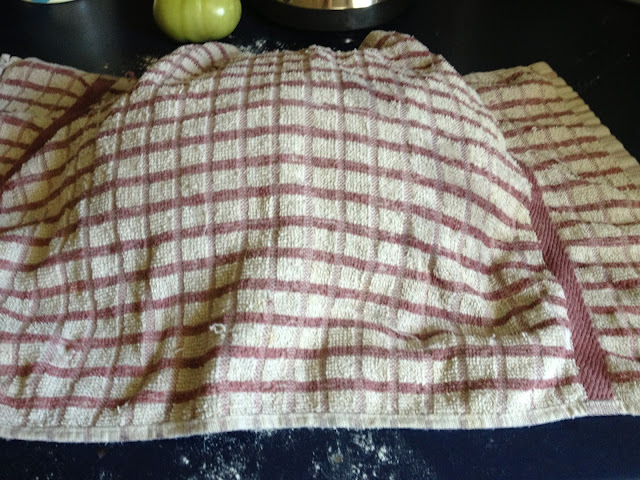 While heating, turn dough out onto a floured surface, form a loaf the shape of your dutch oven. Be careful not to knead or overwork the dough. A couple of turns is all it needs. Cover and allow to rest until oven is preheated. Remove dutch oven from oven and place loaf carefully into the pot. You can dust the bottom with cornmeal, or not. I have stopped doing this, because it is so hard to find organic corn meal, and the loaf doesn't stick when you don't use it. 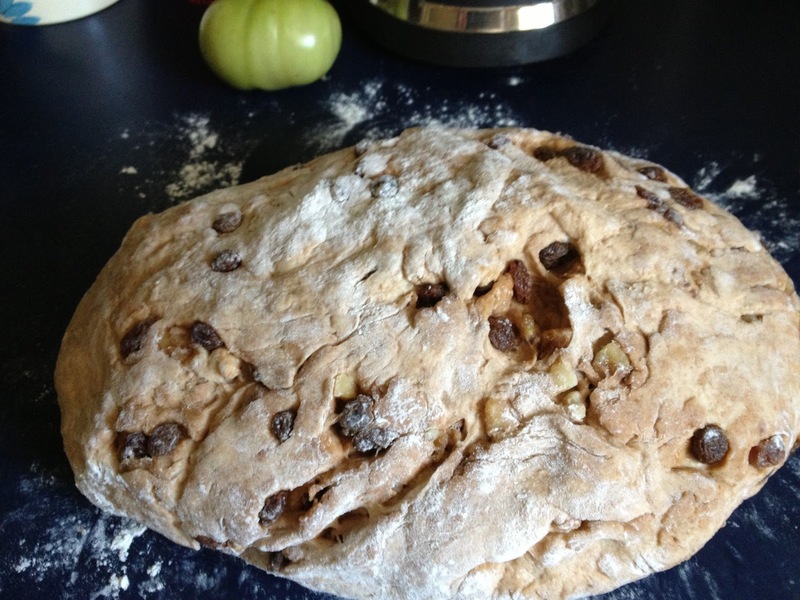 Sometimes a couple raisins will remain, but the loaf comes out undamaged. Put lid on and return dutch oven to oven. Bake for 30 minutes. Reduce heat to 400. Remove lid. Bake for an additional 10 minutes. Remove from oven, let sit for 10 or so minutes then shake out from the pan onto a cooling rack to continue cooling...if you can resist not cutting into it immediately! Hope you try the recipe! And more so I hope you contemplate your own relationship to bread and milk, the earth and mankind. Blessings if you find new truth for yourself.